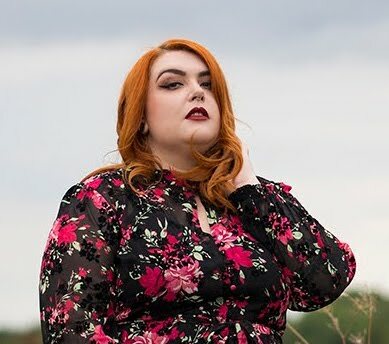 BRAND SPOTLIGHT : CURVY KATE - Sugar, Darling? I for one have been dying to try one of their Daily Dream bras for so long but they didn't go up to the size 44 back that I needed - until now! To celebrate the occasion the team very kindly sent me this beautiful Daily Dream Blueberry Mix Padded Balcony Bra (£29.00*) and the matching Cheeky Shorts (£16.00*) to try and let me tell you, I LOVE THEM! This is the first padded bra from CK that I have tried and it gives such great shape and a lovely smooth silhouette, so even under a thin tee you can't see lots of seams as with a lot of other bras. The acid green and deep teal colour palette is just beautiful too and so different to any other sets that I have. If you're on the lookout for some new lingerie please do check out Curvy Kate, now there are more bras than ever in a D cup and above that go up to a 44 back and even more cute knickers up to a size 24.